Hey everybody, I wanted to share this AMAZING app I have on my iPhone. I came across this app a few months ago and have been using it ever since, then yesterday when I was using it I was struck with the *AHA* moment that maybe you all would like to know about it as well! 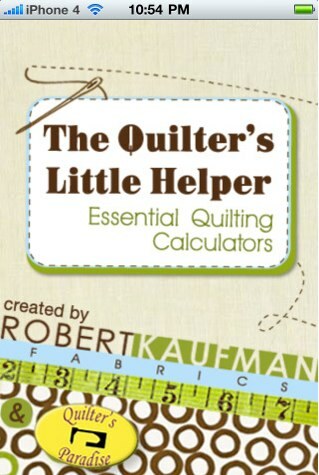 Robert Kaufman has this FREE app out that you can download to your smart phone! This one actually shows you how to best cut the fabric also to get the most pieces!! I'm not sure which Smartphones will readily have access but I know iPhone users will have access. Anybody else have any apps that they use for quilting?? I'm not sure if my phone is smart enough (it's a DROID), but I'm sure going to check! Thanks. I have a totally uncool, and untrendy ancient Nokia, but this looks cool! This app is also available in an Android version. I love it.